Why Doesn't America Celebrate Guys Like This? Just asking. I know it's a life insurance commercial and all. But the fact that it is a commercial proves (to me anyway) that this side of humanity is totally appealing and so very worth celebrating! So why doesn't Americana celebrate guys like this? Anyway, I hope you enjoy this refreshing commercial on this snowy, snowy day. It is often been said that NYS Assembly Speaker Sheldon Silver ("Shelly" to all of the people he knows and many he doesn't) cares only about three things in his professional life: His district of Lower Manhattan, His position as Assembly Speaker and the people who make him the speaker; Democratic Assemblymen and women. Everyone I know who knows Albany thinks just this way and they are usually quick to share the sentiment. This is why news of his arrest today and the charges that now loom over him and his freedom (and two of the three things he cares most about) seems at first glance to be very bad news. He has been a very big defender of teachers and supporter of teachers unions throughout his entire time as speaker. His arrest, as the thinking is going today, represents a very big setback for all of the things that protect teachers -and at the very moment that the governor has announced an aggressive anti teacher agenda. The Raging Horse Blog exclaimed, "this is the stuff nightmares are made of". The Perdido Street School Blog elaborates that "With Assembly Dems in disarray after today's Silver indictment, you can bet Cuomo gets everything he wants in the budget.". Nobody and I mean nobody, expect this doofus Federal Prosecutor who charged Silver, Preet Bharara, wanted this man arrested and indicted today. Indeed, Bharara could have indicted him during December or even earlier in January but he chose to do it just after Cuomo's speech precisely because today was the first official day of the New York State Budget season. Legislatures have to decide on how to spend massive amounts of monies and raise massive amounts of taxes and provide a massive amounts of services and how to service a massive amount of debt (I heard someone estimate once that New York State is the fifth largest debtor in the world. That's a lot of debt to service). Because of this, all of the important decisions in NY's government are made during this period of time. This, my friends, is budget season. It's like the playoffs for lawmakers and they (not even Cuomo) need no distractions. And the political structure depends upon stability. The more stable things are, the more work actually gets done. Corrupt? yep. Back room deals? Sure. Work that gets done but brings no real change? You betcha. Welcome to the American paradigm of democracy. Now we all think Silver is a super powerful political broker. While this isn't false, it's not exactly true either. He has been able to keep his grip on power for so long because he does the bidding of his colleagues in the Assembly (who, remember, are his constituents as he serves as Speaker) and he never leaves the consensus that they have formed. The word is that he will support any bill (as long as it doesn't hurt his district back home) that the majority Assembly Democrats would like. He also doesn't care if he takes the blame for it. Unless you're an Assembly Democrat, you can yell and yell and yell until you're blue in the face and he will simply not care. Assembly Democrats, shortly before Bhahara unloaded on Silver, emerged from a closed-door Thursday morning conference at the Capitol to voice their support of their accused leader. The ones who count don't care about his arrest. As long as they support him, he'll be the speaker -and as long as he's the speaker, he'll do their bidding (that's democratic politics) and he will care not what the rest of the world says about him (that's Sheldon Silver). And what is the bidding of the people in the Assembly who support Sheldon Silver? Well, the biggest donor to campaigns throughout New York State is the union that represents THE FINEST group of professionals in our society: NYSUT (aka the UFT). We're the biggest donors. Any teacher who's ever been up on the busses for a lobbing session and has seen Assemblymen stop what they're doing to make sure a group of UFTers were spoken to has experienced the benefits of our COPE money at work. This too is democratic politics (happy face). This is why I was not surprised to see the Perdido Street School Blog later proclaim that Assembly Dems Back Sheldon Silver Staying On As Speaker. Of course they are!!! It's budget season. Everyone's got work to do and he's the guy who goes to bat for them. So don't listen to the hype, don't buy into the fear and don't step in the bulls___. One takeaway re Sheldon Silver's troubles? Teachers have nothing to worry about (not this year anyway). 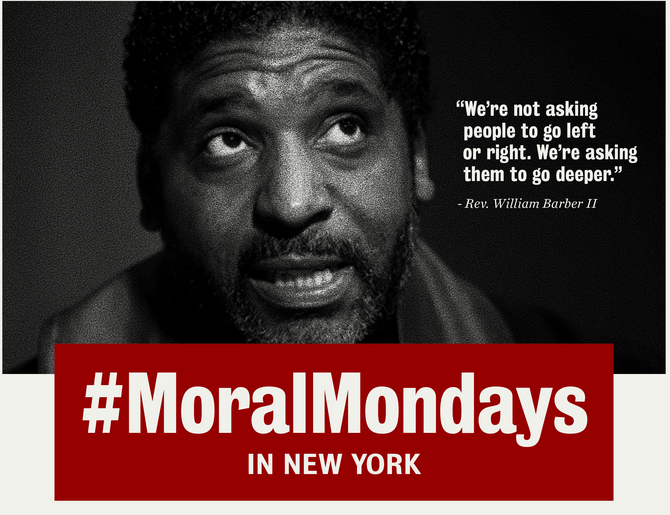 Moral Mondays in New York!!!!! I remember the height of the Bloomberg days. The gotcha squads, the advancement of the 'bad teacher' narrative in the press, the rules changes and policy enactments that placed teachers in jeopardy of losing their jobs. This is just a sampling of how teachers were brought under fire -and that was just a way to advance an agenda that was tilted against public education. That whole war began when no one was looking. It started back in 2005 with the enactment of a new teacher contract. Only the smart ones realized that a few provisions of that contract placed teachers in the most vulnerable positions they had been. NYC Educator was one of the few folks who realized that not being able to grieve a letter to file (and that the new 'open market system' for transfers) were very dangerous to teachers. James Eterno was another, as was Norm Scott. Although the hammer didn't start dropping until two years later, he and others, wound up being completely correct. It was only when Klein enacted the gotcha squad and changed a bunch of Chancellor's Regulations in order to 'catch' more teachers (and a whole bunch of other stunts) that many of us began to truly understand the depths of our peril. Of course, by that time it was too late and the now famous #edwars here in New York City had begun. This same pattern is playing out on the state level -where so many more teachers will be effected. No one is looking! And as only the active teachers are paying attention, the Governor is set to embark on an ambitious campaign specifically tilted against public schools and against public school teachers. He considers people wearing a button asking to 'respect public education' offensive. He is gearing up for a blitz on our strength -our union- so that he enact policies that will only be painful to parents, teachers and other stakeholders who have devoted their careers to education profession. The governor considers this a monopoly. Many of us know it to be a public trust. He thinks that privatizing much of our public education system is a good thing. That many folks believe that defending and strengthening public ed through doubling a commitment to equity is better way to go. There are a few real heroes heading up to Albany tomorrow to tell the governor he's wrong (and that folks are paying attention). If you're able to go, you should go. Info about the event, part of the Moral Mondays movement, because saving public Ed is also about social justice, is pasted below. Although I'm a little hesitant to place the contact info of Maria Bautista in this post, contacting MORE's Mindy Rosier (@MindyRosier), who will be one of the captains for the buses leaving from the city tomorrow is a good place to start. AQENY's website is another. Plenty of parking near those buses and the trip up to Albany is one of the most pleasant anywhere when you don't have to drive! Eastern Parkway and Nostrand Avenue-Bk 6:30 a.m.
60 Cook Avenue- Bklyn 6:30 a.m. I was a poor twelve year old boy who had been left behind by Reaganomics when Mario Cuomo spoke at the 1984 Democratic National Convention. I didn't realize this before the speech. But I sure knew it when it was over. I always hesitate to talk about being a poor kid. It is really cliché and I've grown up to be a much cooler guy than that. But 1984 was particularly tough for us. Mom made $10,000 that year (median income in New York was close $42,000) and we just barely scraped by. The gas furnace broke and our house had no hot water for the entire year. She was two months behind on the mortgage by the time school ended and it concerned her. The cheapest hot meal a working mom could make was probably scrambled eggs and we had them for dinner every Monday and Thursday night (and some Wednesdays too!). That said, there were more than a few people we knew who weren't doing so great back then and mom and folks from our Lake Streets neighborhood were always quick to remind me that there were tons of people out there who were far worse off than we were. Funny thing about self pity, whenever it isn't allowed to enter into the equation of a tough situation (and it never was for me), it doesn't hurt as much. What did hurt was being compelled to watch these boring news shows! My mom made me watch them each and every night. The usual routine had me in front of the TV with her watching Roger Grimsby and 6:00, followed by Frank Reynolds 6:30. I would try to distract myself and think about other things during this time, but it was no use. During commercial breaks, she'd always quiz me and explain the background information from some of the stories we'd just seen to make sure I was paying attention and that I understood. And whenever news "specials" were aired, I'd always have to watch them with her. So, when the summer came and the politicians started talking on the TV, there I was, in our hot living room, listening to the roar of two loud old metal fans trying to cool us off and watching an incredibly boring National Convention on a TV that had to be turned up to almost full blast just to hear. I was a prisoner that night, like so many night before it, and I totally hated it. My mother turned up the TV and called me in from the kitchen just as the crowd was clapping and he was taking the stage. I walked in thinking how torturous and painful the coverage up to that point was, and wanting just to make it through without pulling the hair out of my head. And then he spoke. Oh my goodness. The first few words I heard from that keynote forever hooked me on politics and on Mario M. Cuomo. I read over a text the other night as I was putting this post together and I can almost remember hearing the words blaring out of the old Zenith just over the hum of the fans. "Please allow me to skip the stories and the poetry and the temptation to deal in nice but vague rhetoric". There was a sense of urgency in his voice that just grabbed you and drew you in by sheer force. It was a tone that had no time for BS or to be just grateful for being there but wanted to get straight to the point. After a moment or two I stopped paying attention to the fans or the heat or my mother and zoned in on this guy in the suit -speaking. Less than a minute or so into the speech, right about here, something happened that I don't think I'll ever forget. When Cuomo started talking about poor, and said that there was 'more poor than ever' in America, my mother, never a melodramatic woman, welled up and started to cry. I had no idea why she was crying but, in what seemed like an long instant, the crying turned into this weeping and then straight into all out sobbing. I had never seen that before. It was weird watching it happen, too. I mean, I felt terrible for her and everything (what son wouldn't?) but I had never thought that anything these boring suits ever had to say was connected with my mother in any way. Yet there she was. Sobbing. She started to cry so hard that she decided to call it a night before the speech had ended. Without another word she shut off the TV, unplugged the fans, closed all the lights, then motioned for me, because it was all she could muster, to go to bed. In a flash, the house was silent and I was up in my room wondering what the hell had just happened. Of course I snuck back right down after she closed her door! Sure I was interested in the speech and all, but I really wanted to figure out exactly what it was that made my mother cry. There were no fans this time and no lights. Just me and the Zenith. And Cuomo. The words he spoke were among the most profound I had ever heard. That my own current world view is aligned with the contents of that speech may be total coincidence or may not. Certainly, I freely admit to not understanding 90% of what I heard that night, but what little I did understand at age twelve lead me to one of the first adult realizations I had ever had. You see, Regan's commercials that year proclaimed that it was "Morning in America" again. But 1984 was definitely not morning in my little Long Island town. The recovery hadn't yet hit anyone on the lower ends of the socioeconomic ladder and between the changes to welfare and the cuts to financial aid, almost every one of my neighbors was actually doing a bit worse than before. My house was definitely not part of any shiny city on a hill and not, so far as I knew, any place that Reagan had ever visited. Sitting there watching the words flow from what was clearly a brilliant man, I realized that my mother and I had been left behind. This is why she cried. But I also realized that people like Mario Cuomo were pissed off about that and this, in its own odd way, is also why she cried. You cry when someone recognizes your pain. It is part of the process of healing. It wasn't until many years later, during a conversation with a college professor, that I understood what that speech was about. As it turned out, the 1980s left a lot of people behind. Cuomo knew that and spoke out against it in oratory that rivaled anything Lincoln had ever delivered. Of course, I know more about politicians now than I did then and I reflect on his speech today with sober eye. But one night, thirty years ago, the Hamlet On the Hudson made a twelve year old version of me realize that this world wasn't as big as it seemed, that my experience had a place in it and that that place really (really) sucked. I was a different kid when I finally shut the TV off and went to sleep. I can't imagine what kind of person I'd be today had I not seen that speech. As poor kids go, I drew a lucky hand. I guess all those news shows I had to watch stuck and, unlike some of my friends, I was able to understand most of the books I read so I just kept reading. I went on to be the first in my family to finish college and the first to enjoy a middle class job and lifestyle (that too is cliché but, hell, I earned it). I live a fairly modest life but, in terms of where I started, it feels like the darn Shangri La. In its own small way, my story is one of those small American miracles you see every so often on the Hallmark channel. I came to teaching for many reasons. They mostly have to do with giving back the gift of education (and with this Pope I know who keeps insisting I have to do my part to make the world a better place). But there is only one reason why I chose to teach Title I students in an urban setting. It comes from that moment, back in '84, when I snuck down to a TV and soaked in what being poor in America really meant. It meant anonymity and struggle and disappointment. It meant hardship and confusion and loneliness. I hated that, no kid wouldn't, and I wanted to do my small part to help others leave it behind the way I had been able to. So it's no small thing to say that Mario Cuomo's speech is a major reason I currently teach in New York City. Which is so incredibly ironic, because his son is such a heel!!!!! Since 1984 economic disparity in this nation (the theme of Cuomo's remarks) has ballooned (here here here here) to proportions that Cuomo the senior might describe as catastrophic and have trouble wrapping even his head around. The 'have-nots' in our nation now outnumber the 'haves' by such an amount that inequality has become the new norm and, for many, cliché. The growth in power of the American service and financial sectors has been a big vehicle bringing this change. From it we have jokes like Grandma Millie and theories like "Too Big To Fail" -both of which have become all too common in our common language- to reminded us that our most powerful institutions are no longer aligned with the rules of the social contract but are subject to the whims of a free market. This trend has infiltrated the most basic public good of any society -education. Financial profiteers now refer to my profession as an "economic sector" (within this context, my school district is referred to as a monopoly). Their funds give tax shelter to the enormous wealth they have accumulated and allow the growth of charter schools, 'foundations' designed to rethink education and "non profits" that are perfectly free to pay whatever six figure salary to their officers they wish. Since 2001, schools have been placed in the untenable position of pumping out miracles like me as a matter of routine. Indeed, if they miss their quota (better than last year's AYP), they face stiff penalties. This trend has created a downward pressure on classroom teachers that is almost beyond description. I now prep late into the night and grade early in the morning just to feel secure that I will keep my job. And Mario's closest advisor, his own son, has switched sides and joined the winning team. He takes money from Wall Street in general and from Hedge Funders in particular. He employs devices like Orwellian doublethink, cardstacking and banal obfuscation, in hopes of having people believe that teachers should be trusted less and that they he (not they) is the one who looks out for students more. Though they have many flaws, he intends to make the many new teacher evaluation systems throughout the state more difficult than they already are and offers as reason for this only that the test scores do not match the ineffective ratings issued to teachers throughout the state. Bringing 'not the sinner but the righteous to repentance' he wants voters to believe that teachers are responsible for the academic failure on state tests -as though up is down (as though social structures, or economic structures or failed governmental policies championed by him have no bearing whatsoever on the present state of our state) and down is up. And he intends to go full speed -starting this month during the state budget process- down this very policy path. The other day, when I tweeted that Andrew Cuomo was proving why teachers need a strong union defending them, one of my more favorite Twitter followers replied that Cuomo didn't think teachers were bad at all, just that the money was better on the other side and that his big donors -the banks and the hedge funders- needed to bust unions and get their hands on the wealthy health and pension funds that we have amassed. I won't argue with that assessment. I think it's accurate. Andrew's not such a bad guy. But he is answerable to people who have probably been helping him since 2008 and he his quite ruthless. The new governor is all about his power. That means he is all about taking care of those who placed him in power and teachers most certainly did not place Andrew Cuomo in power. He has become a living lesson in how you can go from associating a name with Hamlet to associating it with Macbeth in one quick generation. Thirty years later, that city on the hill has become a lot smaller and places that the folks like the real governor's son do not visit have become a lot more populated. We need a leader to start talking about that again -we all need to start talking about that and stop talking about bad teachers. I am deeply disappointed that Cuomo's son is not that leader, even if I am eternally grateful for a few important words he spoke when I was a kid.